The Luxy Beauty Care Intensive Stretch Mark Cream promises to visibly improve the appearance of stretch marks in just 3 weeks and here is our review of our short product trial. The cream promises to actively remove the appearance of even old marks, while improving the future prospect for fewer stretch marks by improving the health of the body’s collagen and elastin, the tearing of which is the cause of stretch marks. Keep reading if you’d like to know more about how the product works, the ingredients inside, the scoop on cost, and more. All of the ingredients inside are natural, and derived from plants, fruits, or vegetables, and almost all have deep moisturising effects; the shea and cocoa butters, aloe vera, and jojoba oil in particular. The Rosehip seed strengthens the skin and reduces the stress caused by the stretching, both protecting against future problems, and healing existing scars. All of these as well as the olive oil, orange oil, glycerin, tocopheryl acetate, and panthenol are all dosing your skin up with essential vitamins and antioxidants which maintain general health and encourage the healing of your skin. Finally, the oils are known for helping collagen production, slowing the ageing process of your skin, and for making your skin generally more elastic, and toned. For the best effects, and to see improvements in only three weeks you should apply liberally all over the body, cover all areas that can be affected for example, the buttocks, breast, legs, hips and so on, twice daily. Don’t worry about using too much, the product is all natural and unlikely to cause any short or long-term side-effects. Luxy Beauty Care sells on Amazon for $50. They are however currently running a promotion, and have slashed the price to only $22. You can also buy this item with other similar items for other special offers. The guarantee offered is for a full refund within 30 days of purchase. The product claims to work within 21 days, so it is possible if you use it immediately to claim your money back if you’ve had no success in 3 weeks. However, this period still seems a little tight, you might feel like the clock is ticking on your warranty. The ingredients list is simple and natural. The price at $50 is a little steep, but at least it’s often available at less than half price, as it can regularly be found on Amazon on promotion. For the full price tag in particular, it certainly is not the most potent formula you can find online. And it’s a real shame that the guarantee is so short, it doesn’t really give enough time to judge the product, and the worry is that if you are unhappy, you might well miss the deadline. As a result, we advise that you keep looking for the perfect stretch mark product. 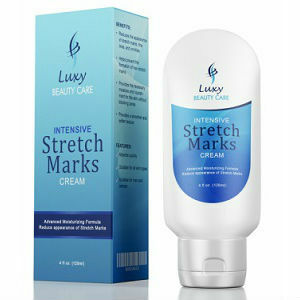 David Carney	reviewed Luxy Beauty Care Intensive Stretch Mark Cream	on August 5th	 and gave it a rating of 3.